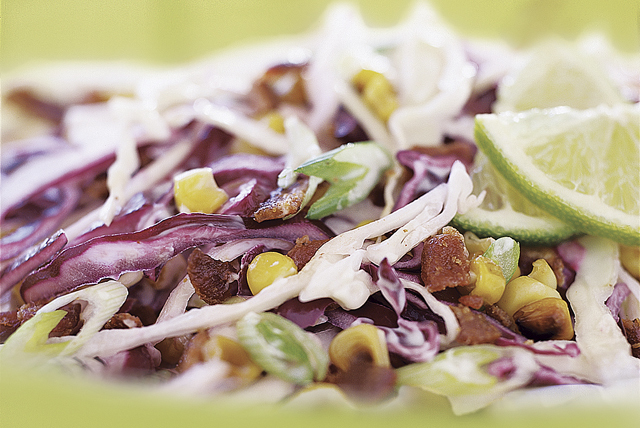 Give your next batch of coleslaw a flavor boost with a few Latin-inspired ingredients, including lime juice, corn and serrano chiles. Combine mayo, lime juice, hot pepper sauce and salt; set aside. Cook corn in large skillet on medium-high heat until golden brown, stirring frequently. Place in large bowl. Add cabbage, chiles, bacon and onions; mix lightly. Stir in mayo mixture. Serve immediately or cover and refrigerate until ready to serve. Save 50 calories and 6.5 grams of fat per serving by preparing with KRAFT Mayo Fat Free Mayonnaise Dressing. Choose cabbage with fresh, crisp-looking leaves that are firmly packed; the head should be heavy for its size. For a mild-flavored slaw, omit red pepper sauce and serrano chiles.